Paris for Visitors is part of Europe for Visitors, a Forbes and Washington Post "Best of the Web" travel-planning site that has given unbiased advice to millions of travelers from around the world since the 1990s. 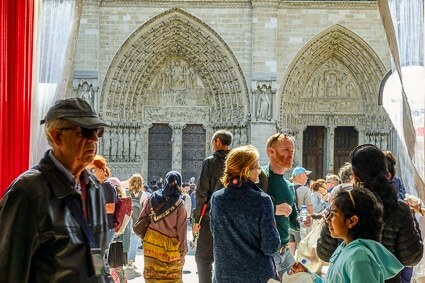 ABOVE: Our favorite Paris event, the annual Fête du Pain, is a bread-baking festival that takes place every spring in front of Notre-Dame Cathedral. We're hoping there will still be room for the festival's tent next May, when the cathedral will be under renovation after this week's horrific fire. Browse our complete list of illustrated travel articles about Paris, France. Our easy-to-read, step-by-step guide will help you pick the right type of accommodation and neighborhood for your visit. Read our tips on using the Métro, RER, buses, trams, and taxis in Paris, plus our advice on ground transportion from Charles de Gaulle, Orly, and Beauvais airports. Also see our guide to Paris River Cruise Ports. Minimize frustration, save money, and have more fun in Paris by avoiding the most common traveler's goofs. Learn about museums, monuments, sightseeing buses and boats, special-interest tours, balloon ascents, a dog cemetery with live cats, and related topics. Our smartphone-optimized pages are designed for fast loading, easy reading, and minimum data usage.